Sony proclaims that they are all-in for full-frame cinematography (e.g., the video heading up this post). But what Sony needs to do first (and should have done last year), couldn’t be simpler. They almost nailed it with their NEX-VG900, putting a full-frame sensor in the proven/award-winning/ergonomically fantastic VG-series camcorder body. But the VG900 was barely too early for the market, and it aliased like a 5D Mark II. The sensor wasn’t purpose-built for video. Yet, how easily folks have forgotten that the NEX-VG10 was absolutely revolutionary when it arrived! Just speaking for myself, it was my entry point into filmmaking, and around it, I built my first camera user group that eventually became this community. Sony’s auto-pilot, pernicious behavior is to fiercely defend its professional camcorders that are at the highest profit margins, amounting to impossible options for independent filmmakers, and what they’re cooking up next will be no exception to that corporate universe. Yet their debacle of overheating in the a7 series, and obvious dissatisfaction from creatives who want bare-minimum-quality audio inputs, manual controls, etc., is easily and quickly addressed by simply putting the a7S II sensor into the VG form factor. 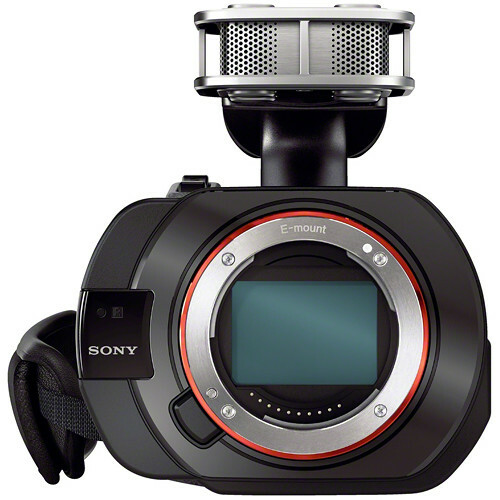 They can (and need to) do this without charging much more than a grand as a premium, on top of what the a7S II costs. Even that is a largely artificial expense. Sony doesn’t know how to read supply-and-demand curves. 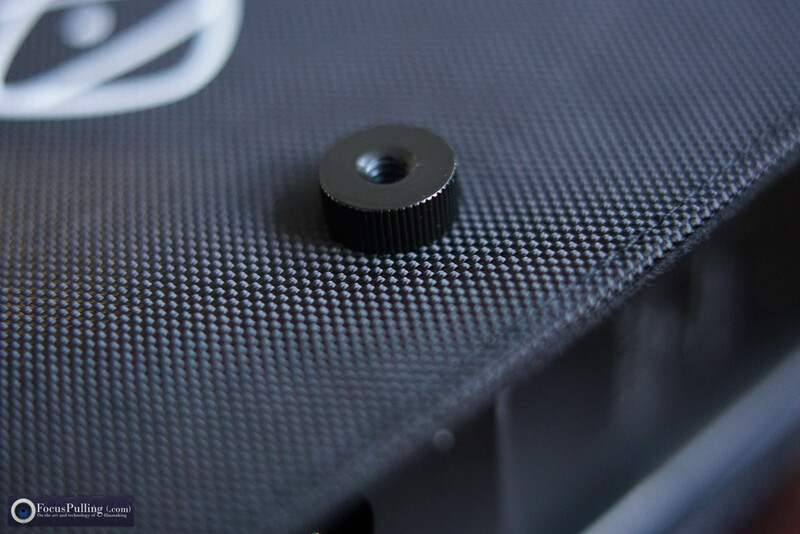 An a7S II sensor in an affordable VG camcorder body would sell extremely well. It will take some thinking outside the box, ruffling old-world hierarchical feathers overseas, but it needs to be done. Think of how Blackmagic upended the camcorder world, with the aim to democratize technology instead of penny-pinching that’s practiced by protectionist mid-level accountants from Ivy League schools of theory. The best technology evolutions are always bottom-up, not top-down. Time for Sony to wake up. Sony have just announced two new additions to their full-frame E-mount lens line-up. 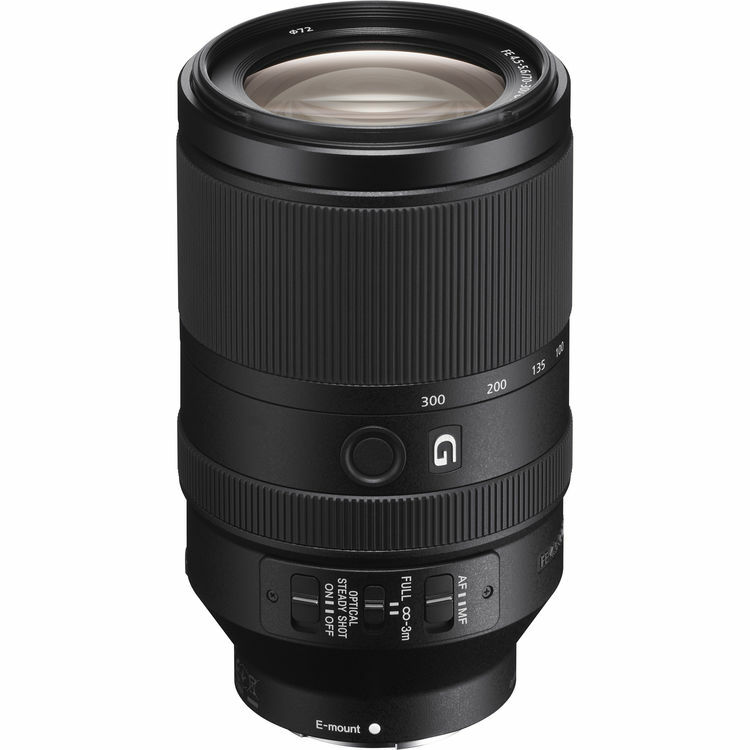 One of them is a surprisingly affordable alternative to their 55mm f/1.8 Zeiss prime lens, and the other is a very long telephoto zoom lens that serves to “compensate” for the shorter focal reach implicit in full-frame sensors, to those of us coming over from crop sensors. What it does have in common with the Zeiss, though, is that it skimps on optical image stabilization (what Sony calls SteadyShot). The feature has long been debated, mostly among still photographers who perpetuate the fallacy that it can damage image quality, and can substantially raise the cost of lens manufacture. Less known is the fact that even on a Sony body with internal 5-axis image stabilization, performance is appreciably better when you pair an OSS lens with IBIS. And for anyone without IBIS, the lack of OSS at this focal length is a recipe for amateurish jitter. 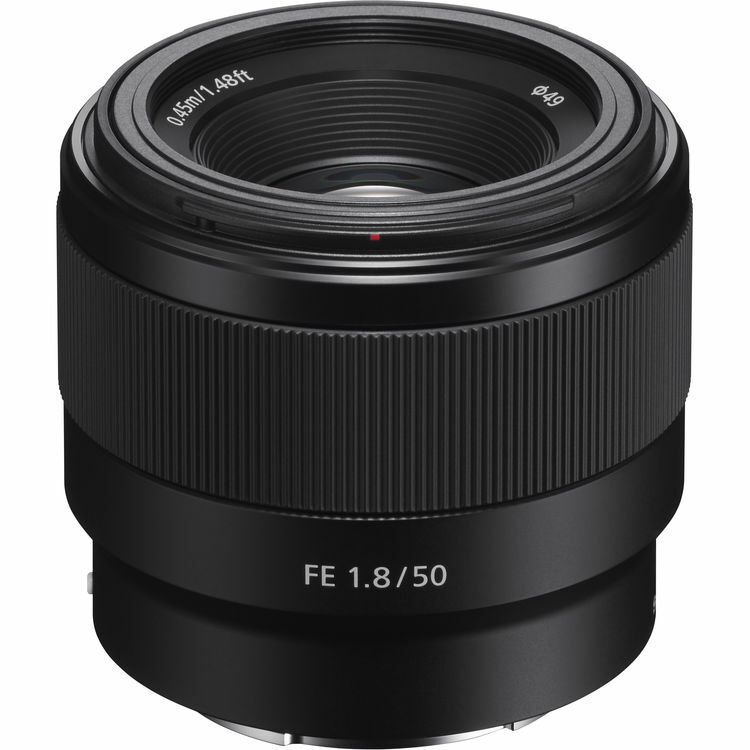 Sony has offered OSS on similarly affordable E-mount lenses before in this small form factor (notably, their 50mm and 35mm primes for crop sensors). It’s an unfortunate trend, motivated by corporate accountants, and we can expect to see an elimination of OSS on mirrorless lenses justified by an increased deployment of IBIS into camera bodies. Though not quite in the same budget territory as the new prime lens, this long zoom at $1,198 offers lots of value to full-frame shooters. Reason is, if we were used to zooms on crop sensors (for example, the flagship 18-200mm zoom lens), going to a full-frame sensor meant that 200mm became not-so-telephoto after all. Absent a crop factor of 1.8x for widescreen video, 300mm gets us into the range of that visible focal length we had enjoyed at 200mm in the Super 35mm world. Granted, this isn’t parfocal, and lacks the continuous bright aperture of the wonderful 28-135mm f/4.0 cine lens, but f/5.6 zoomed all the way in is respectable — remember, the 18-200mm stopped down to a darker and farther f/6.3 at its maximum focal length. I also like the manual controls on this lens barrel, to switch between manual and auto-focus, and yes: Optical SteadyShot is included! Good for you, Sony. Both of these exciting new lenses are available for purchase on Thursday, March 31 at 11am EST. I’ll let you know how they perform as soon as I get my paws on them, but sight-unseen, these look to be winners. I remember the moment when I first got my Panasonic GH4, feeling amazed that it shot 4K without breaking the bank, but also: freaked out! It felt like the beginning of the end for me shooting HD, and sure enough, about a year later, I got fully converted. My whole workflow now is just Ultra-HD (that’s a few insignificant horizontal pixels shy of cinema 4K resolution), even though I’m usually delivering output in HD. So, it was one of those moments, of no turning back, 4K or bust, innocence lost. Mixed emotions! Today Atomos announces its Shogun Flame and Ninja Flame 4K HDR monitor/recorders. 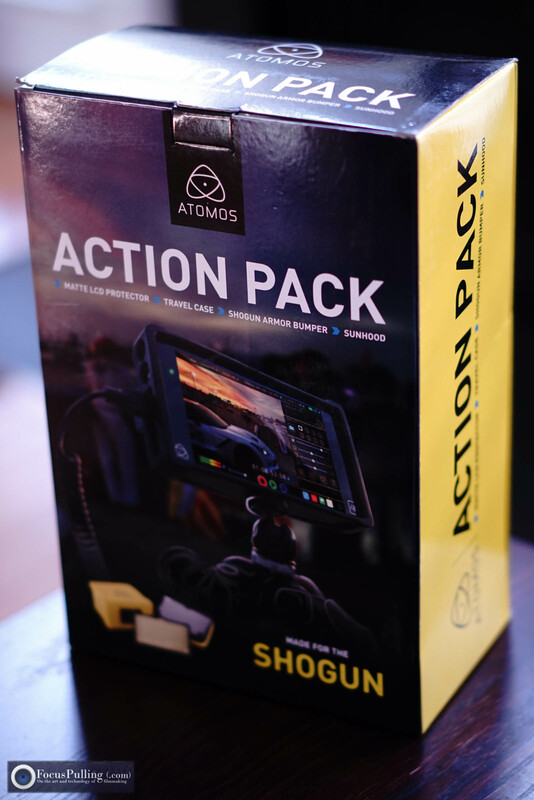 Just like the GH4, you can call this another turning point, because Atomos is a company that makes things for everyone, not just rental houses and moneyed studios. The Shogun Flame is up for pre-order now at $1,695, also the Ninja Flame at $1,295, and they’re both slated to ship March 28th, including a full kit of accessories in a hard case just like the launch of the original Shogun — but sooner. Welcome to the front end of HDR. Unlike 4K resolution, which was an easy upgrade to grasp (just quadruple the dots of HD), high dynamic range (HDR) video is a much more complicated transition: partly, because most of us already have it, and either we aren’t aware, or we’re confused about how to deliver it. But words speak for themselves, and HDR is just what it says: a higher range between the brightest and the darkest in your camera footage, generally 10 or more “stops.” So, these days we’re accustomed to cameras boasting how many stops of dynamic range they can capture, even if the measurement is pretty arbitrary between one manufacturer and the next. One thing’s for sure: the more, the better. And also: it’s only relevant (for now) when you’re shooting in some brand of film log format, which basically squeezes the brightest and the darkest parts of an image into the gooey middle range of an image’s brightness and saturation, making it look “flat” and dull. Sony calls it S-Log2 and S-Log3, Canon calls it C-Log, Panasonic calls it V-Log, Blackmagic simply calls it Film, and so on. As we know, it’s only in post-production, back at the studio, where the flat log footage expands back out into the so-called REC.709 video format that’s ready-to-watch on a television or digital projector. That is, until recently. Sony started baking into their cameras a “Gamma Assist” function, so that even though it’s recording those gooey log images internally, you can see an approximate viewfinder preview of the final result as it would look after post-production color grading. That’s really important when it comes to judging exposure, managing color influences while you have the chance, and your overall composition as a cinematographer. We aren’t goofing around here! 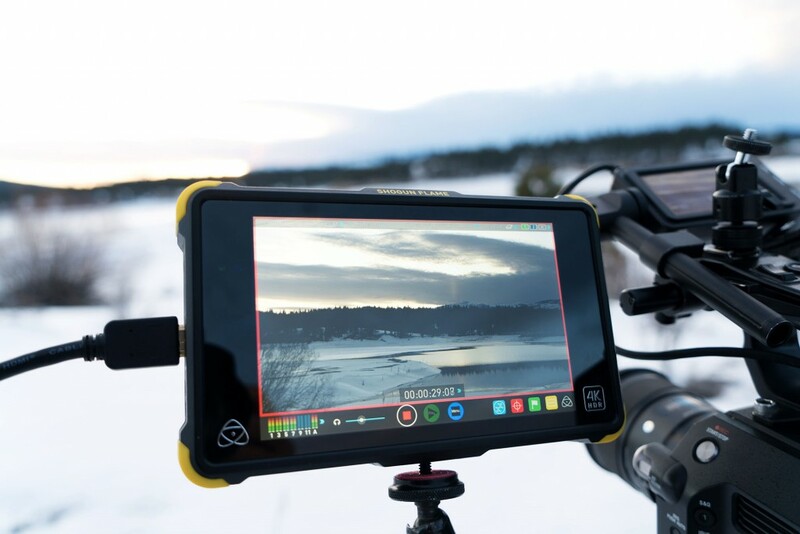 Meanwhile, for those of us with Shoguns, Atomos last year made good on their promise to release a free firmware update that lets us apply our own look-up tables (LUTs), just like “Gamma Assist,” for previewing the real thing. I mean, think about it: when historic/legendary cinematographers peered into Panavision cameras (not today’s mirrorless OLED viewfinders at best), they saw the real world. That’s important! And our own eyes see HDR, on steroids. We deserve something closer to that, whether on location or back in the studio. 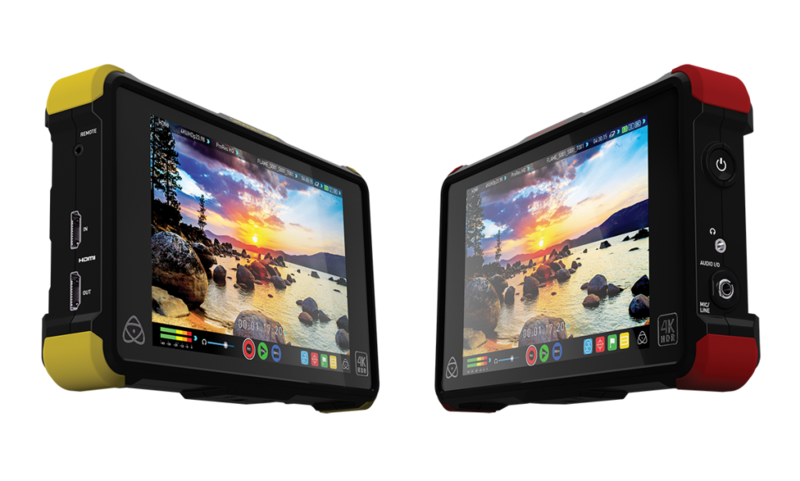 Here’s the catch: Atomos can’t solve your need for HDR farther down the road. That is, their Flames will show you HDR on their monitors, as their prior ones couldn’t, but they’ll still just record whatever log footage you capture, the same as always, straight-to-disk. So, it’s up to you once you’re back at the studio to figure out how to preserve all that detail being captured in log. Normally, whatever LUT you’re using (e.g., FilmConvert) expands your log footage only into the narrow confines of the REC.709 color space, which limits dynamic range to “legal” levels that historically trace back to cathode ray tubes! 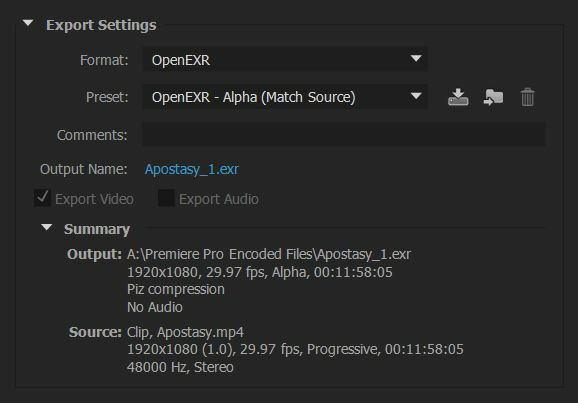 Whereas, for example, the latest version of Adobe Premiere has begun to incorporate HDR into the workflow, offering so far an output format you might notice in Adobe Media Encoder called OpenEXR (seen at right). Meanwhile, when it comes to ultimately viewing the expanded dynamic range of HDR encoded content, there are — surprise, surprise — competing standards between HDR10 and Dolby Vision, sort of like HD-DVD versus Blu-Ray being technically similar but the former more widely adopted in HDR televisions for now. At home, I have a Sony XBR X850C panel with HDR capability that arrived from a firmware update mid-way into the product’s seasonal life. Going forward, most HDTV panels will include HDR capability — that was the moneyball at CES — but standards are still in flux. 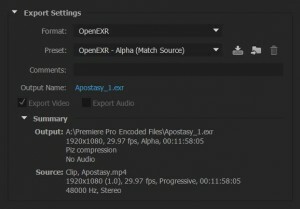 It’s daunting and yet exciting to consider that everything you ever recorded in log can someday get upgraded to a render in HDR, as if this delivery technology existed all along. Archive everything carefully? Back to the Flames, if you’re like me, you might have felt underwhelmed initially by the news that they’re fundamentally an upgrade to an already best-in-class 7-inch monitor. 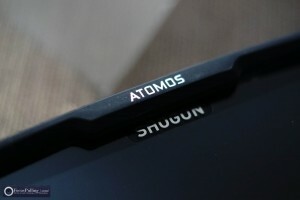 But Atomos has clearly treated this re-boot as an occasion to respect customer feedback in some key areas. Their new design checks off a lot of the boxes that I complained about in my review of the Shogun Action Pack. Their Armor was a rubbery loose fit on the Shogun and Ninja Assassin, but now it’s an integrally tight part of the Flame chassis. It used to be that the Atomos Sun Hood posed an either/or dilemma, because you couldn’t mount it at the same time as the Armor; it’s not a problem anymore on the Flames, adding a “snap-fast” feature instead of screws you could lose — and the Sun Hood is included for free! At that, if you’re shooting without the intention to monitor in HDR, you can flip over to a traditional video mode (REC.709) and get the full 1,500-nit brightness capability of the new Flames for outdoor shooting that has a fighting chance against sunlight, hood or no hood. Between the Shogun and Ninja versions of the Flame, the differences are parallel to their predecessors: the Ninja Flame lacks XLR balanced audio inputs, SDI inputs, and raw recording capability from select cameras, but you save some money too. But both have an upgraded approach to power, addressing a key concern in the battery-hungry original Shogun and Ninja Assassin design, by adding a second battery slot to facilitate longer uninterrupted sessions and hot-swapping. It’s like they incorporated their Power Station that I reviewed here previously, finding that it added too much bulk as a piggybacked accessory onto the Shogun/Ninja Assassin. The Flame design effectively incorporates the best of the Power Station, at no extra cost. 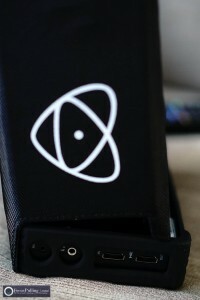 Speaking of which, we’re talking about Atomos here. This is the company from down under (relative to where I am, anyway) who shipped the Shogun with tons of accessories that we’re used to getting gouged for when it comes to cameras, etc. They never charged for firmware updates, and kept them coming. They even shipped out free batteries when folks inevitably complained about the included one dying too soon. I know, you don’t want to penny-pinch when it comes to production of important art/media, but at a time when the costs of gear are soaring into cynical opportunism (say, $2k lenses and bloggers getting flown all over the place to drool), Atomos is sending a message. But mainly, it’s this: HDR is here, and it’s for the masses. 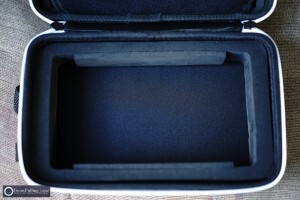 Atomos Master Caddy Docking Station: Got Something Faster? When you use an Atomos recorder like the Shogun or Ninja Assassin, there’s no getting around using those Master Caddy II cartridges. Kind of a hassle, they’re not tool-less, with four tiny screws that need a screwdriver. 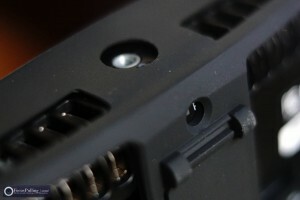 Other than adding a layer of plastic protection, they don’t really do much, and become disconnected easily, as they merely use the same standard flimsy SATA drive connector designed for use inside of a computer case. 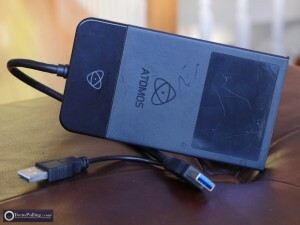 There’s always been the Atomos Powered Docking Station product that mates your Master Caddy II with your computer via USB 3.0 using its single main blue plug, or USB 2.0 using the included pair of plugs. 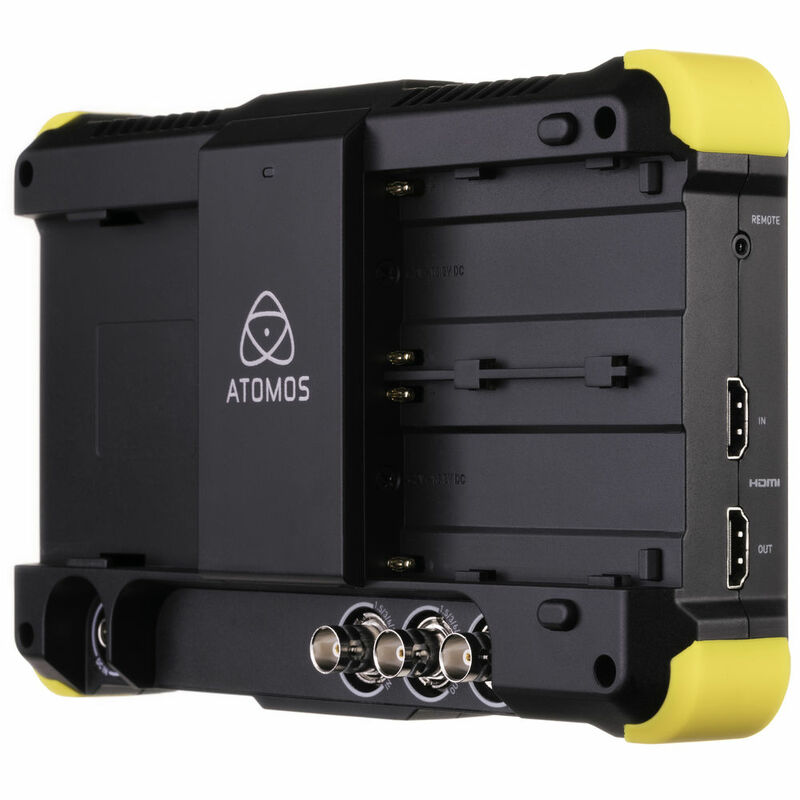 Even at faster USB 3.0, which has a maximum theoretical speed of 5 gigabits per second, the Atomos Powered Dock has often been dogged with the suspicion that it’s a bottleneck, slowing down transfers. 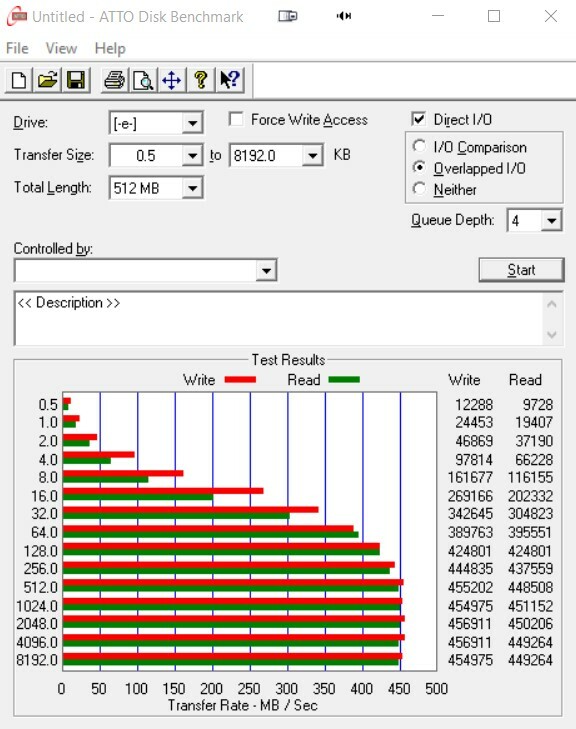 It might be the internal USB 3.0 controller, or something else; but rather than figuring out the reason, I thought I’d run it through some tests and let the data speak for itself. 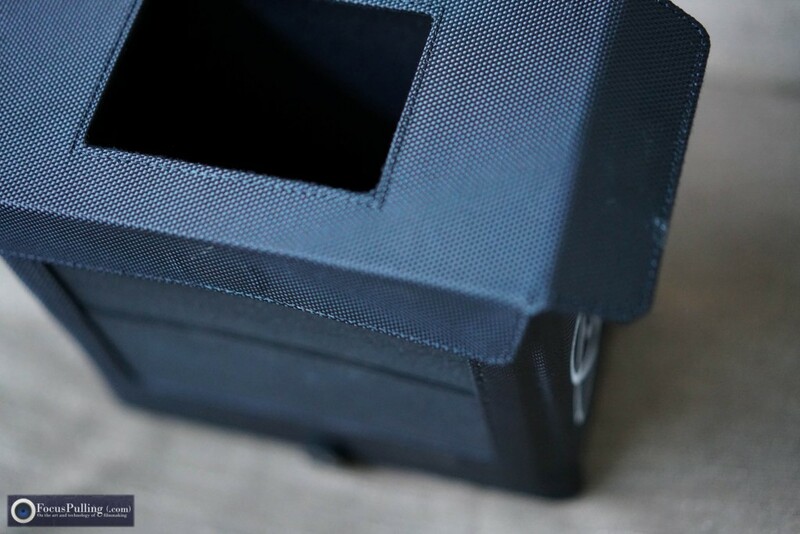 Problem is, that Master Caddy II also increases the height and width of the cartridge surrounding the standard SATA connection, so you can’t just plug it into a typical 2.5″ hard drive dock. You can’t even plug in a standard internal SATA connector, because it won’t go in all the way as the caddy recesses the connector a bit. So, to do this test, I had to go through the hassle of unscrewing the four caddy screws, and remove the hard drive for testing. 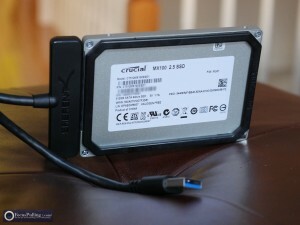 The most simple but also ideally spec’ed tool for this is by Sabrent, seen in this picture, which plugs straight into the bare 2.5″ SSD, and terminates in a USB 3.0 plug (also the additional USB 2.0 connector for more power, if necessary). It features a protocol called UASP that may or may not be available to you, depending on (for example) your computer’s motherboard, for up to 20 percent faster speeds. 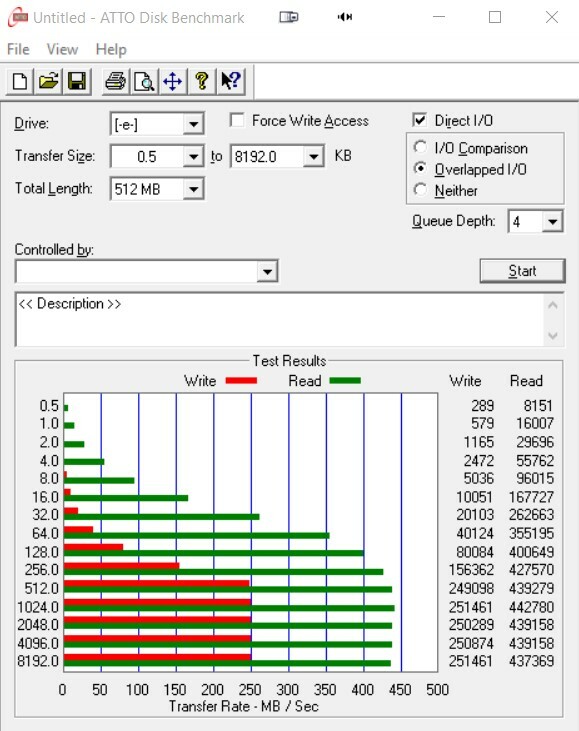 Connected into the Sabrent, my SSD holding numerous Atomos Shogun files performed appreciably faster, as seen in my actual benchmark report above. However, the speed improvement was mainly in the write speed category, which is far less important for the primary reason you’d hook up your Master Caddy II: you’re only reading from it most of the time, to ingest footage onto your hard drive for editing. You can verify this above by comparing my benchmark using the Atomos Powered Docking Station, where the write speeds are considerably slower. Are these tests of much practical value? Not really. First, you still can’t plug the Sabrent Adapter straight into the SSD when it’s screwed into a Master Caddy II – though it would have been nice to use the Sabrent instead, because of its faster speeds, UASP compatibility, and more portable form factor. Second, and again: this isn’t really a workflow for writing onto your SSD, mostly just reading from it for ingesting media, so the speed gain isn’t such a big deal anyway. 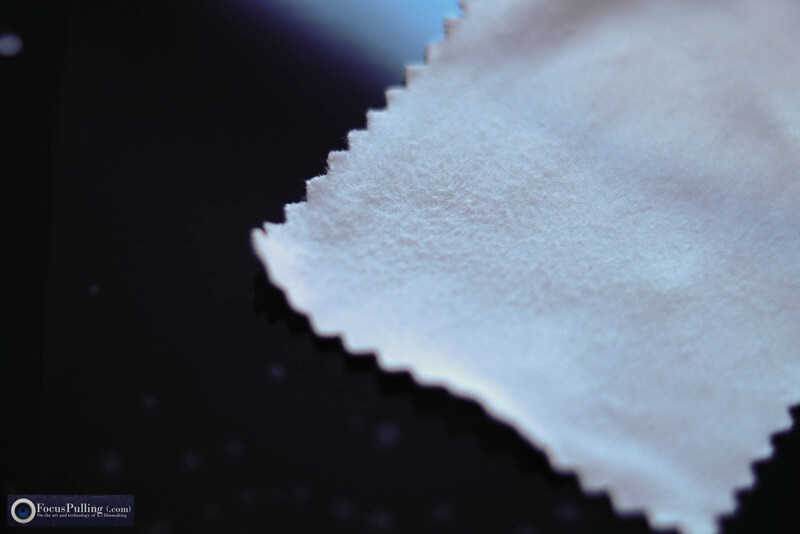 But I’m glad I checked this out, hoping you find it useful too – and please let me know if you’ve gotten different test results using other products. Shogun users have been waiting for the Atomos Action Pack to come out for a long time, not only because it was promised to some of its newest customers for free, but also, we pinned our hopes on it to maybe settle the two biggest complaints about the Shogun: that it’s delicate, and it needs a sun hood. 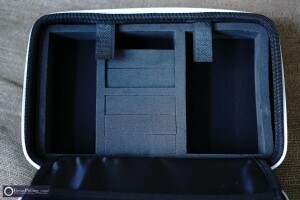 I had an especially inspired reason to anxiously await this Action Pack, and you can see why in the photo to our right. During principal photography for a gimbal-driven dance film during my residency this summer (that’s now in the festival circuit), I stumbled over a tree root, head-first into the ground, and the Shogun screen shattered. First thing to note is, Atomos has a great attitude in customer service, and this incident was no exception. After getting my Shogun happily fixed, their Action Pack soon arrived. Is this what I was waiting for? Sadly, mostly, no! You could buy all the pieces separately, but they’d cost more than the Action Pack when you add it all up. Yet each of them has its unique problems. Starting with the screen protector, there were no instructions on how to carefully apply it: even giving the benefit of the doubt that Atomos customers know their stuff (after sticking a protector onto a smartphone, or even a Palm Pilot further back in time), I found the included wiping cloth to not be lint-free and static-free, defeating its purpose. Check out the macro close-up above-left, of pilling on its surface. Failing to remove dust (and even adding some), you can see in the picture below what quickly happened – and, you veterans of this operation know how after that, there’s no turning back. 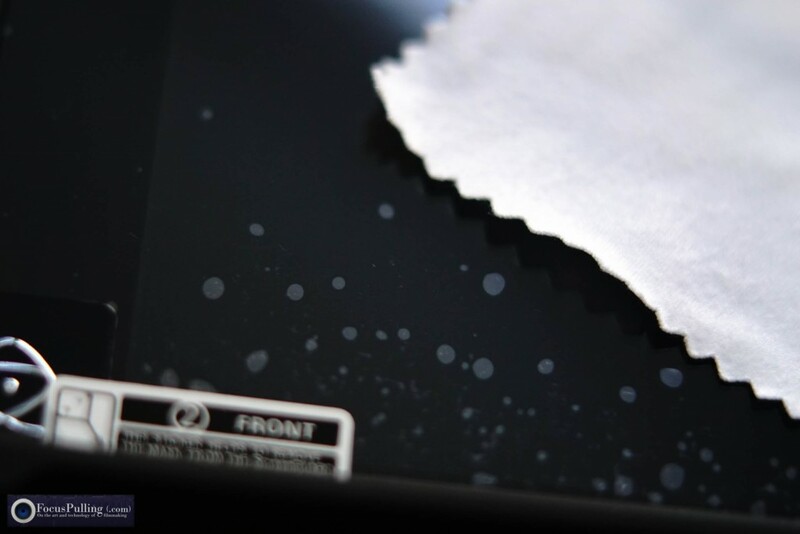 You cannot clean the adhesive side of a screen protector, after it’s gathered any dust. You just live with those little specks forever, or you throw away the screen protector for good (and it’s a $30 price tag if you buy another one separately). Boo! But let’s assume you lucked out and stuck that sheet onto your Shogun like a pro. Moving onto the so-called “Armor,” let’s just say it wouldn’t stop an arrow. I actually liked the decision by Atomos to create a “bumper”-style rubber frame for the Shogun, adding very little weight, making the whole thing “grippy,” and absorbing shock upon impact. In comparison, several metal cages have preceded it (e.g., Varavon and Shape), priced high into the stratosphere for the value you get (considering the low cost to manufacture them). Even your budget option is a bad choice: there’s a “KavalCage” made by a mysterious company called PV Gear with no customer service (ignoring repeated e-mails, eventually admitting that they reply only if they want to), and they hide their full contact information (like, where do they pay their taxes?). 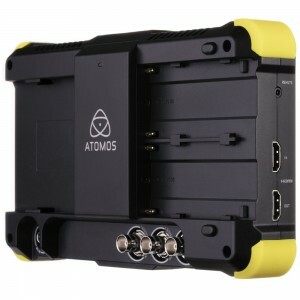 Really, if you want to avoid the expense and bulk and non-shock-absorption of such metal cages, the Atomos Armor may not be such a bad option, bought separately. What you’ve got to live with, though, is a fairly loose fit: in the picture to the right, you can see how the Atomos logo, which is supposed to cover up the Shogun logo, sort of flops out of place easily with no effort. 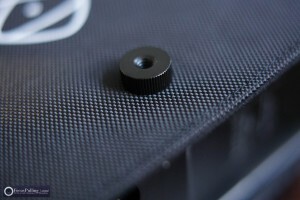 The top of it, seen at left, has cut-outs for thread holes and vents, though you sacrifice an especially firm connection unless you really screw down, dangerously tight into sockets that aren’t well reinforced. 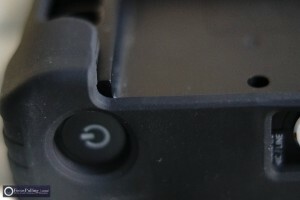 And the rear design is also a missed chance, as seen at right, to address the worrisome problem that SSD cartridges can easily disconnect, as it’s so flush that it doesn’t even add resistance against the cartridges sliding out. Then there’s the sun hood, and it starts off with a dilemma: you can’t use it at the same time as the bumper, shown at left. So it’s either/or, defeating the purpose, while adding set-up/re-configuration time to your shoot. It screws into the top and bottom mounting holes with further loose hardware, seen at right, that can get lost, and feature fairly weak mounting points for the whole hooded and heavier Shogun. 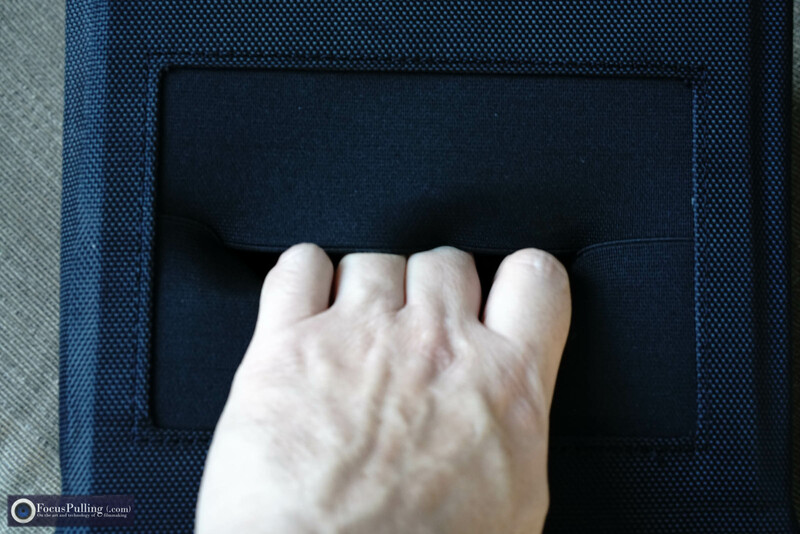 There is a peek-a-boo elastic slot that lets you access the Shogun’s touchscreen (or for finger-puppet shows), weirdly on the upside-down side. And there’s also a sub-hood of sorts, framing the opening even smaller for more sun protection and/or privacy, which is a nice idea, but unfortunately doesn’t stay in place well at all, as seen in the photo below: those side flaps are magnetic, but here you are looking at them in their relaxed, fitted state: simply not adhering properly. But let’s assume you still dig all these parts in the kit. How about the case that keeps them all together? Well, to start with, it’s pretty big. 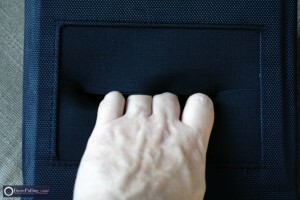 With both a top and bottom compartment, you might not use all the space. (Reminds me of the original gigantic Pelican-style case that Atomos generously included with all their first-run Shoguns – now, it’s optional.) 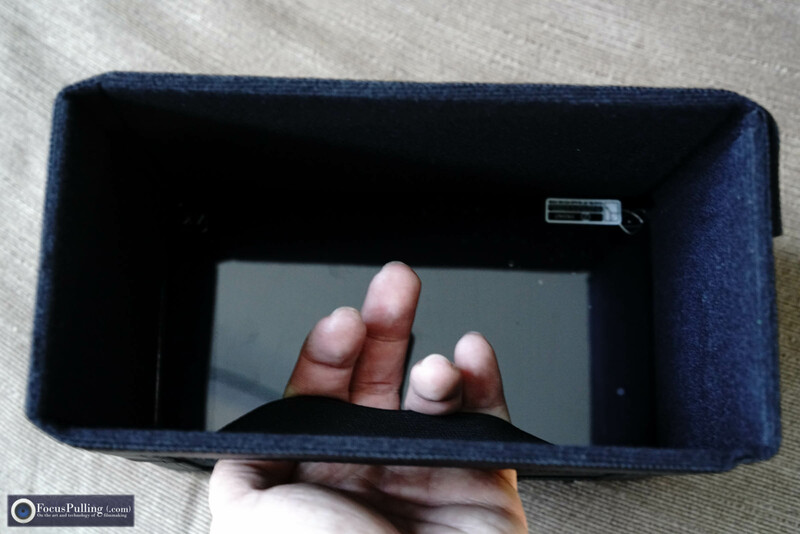 Yet it doesn’t store the sun hood anyway, and then without the bumper on (because you’ll be using the sun hood on a shoot), the case’s Shogun compartment isn’t snug anymore. 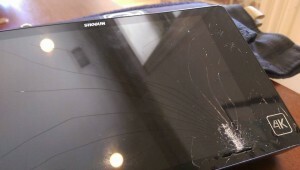 Honestly, I wasn’t in the majority complaining camp, when the Shogun finally arrived to market: I understood that Gorilla Glass would take its price tag too far north, and I didn’t see much difference between a hard plastic chassis and a heavy metal cage in terms of durability. I probably would have cracked my screen anyway, with one kind of armor or another, and also it feels less important to me keeping the Shogun cosmetically prim compared to more important things like camera bodies, lenses, exposed glass and sensors. Between overpriced/heavy metal cages, and this Action Pack, we still seem to have a problem with no ideal solution. I suppose I’ll just keep risking it, like we do on any shoot these days, hauling around such a complicated melange of gear as it is. You'll receive one email per week at most, with posts you maybe missed, and your information won't be used for any other purpose. Thanks for plugging in. Follow FocusPulling (.com)'s board RigShots on Pinterest.